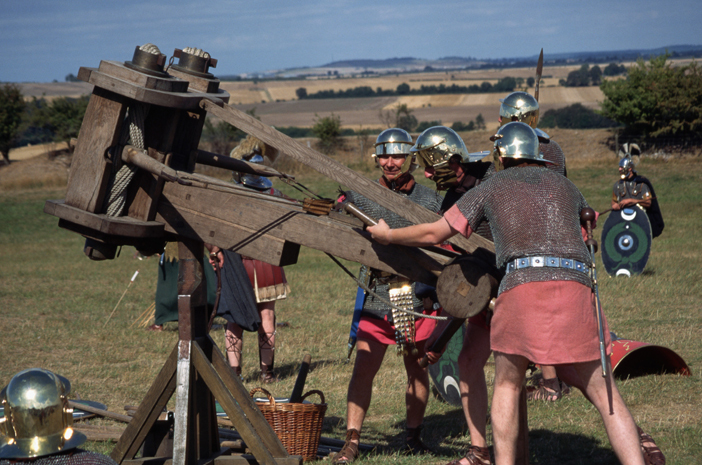 Of course we have to start with Archimedes’ weapons, used against the Roman besiegers of Syracuse. 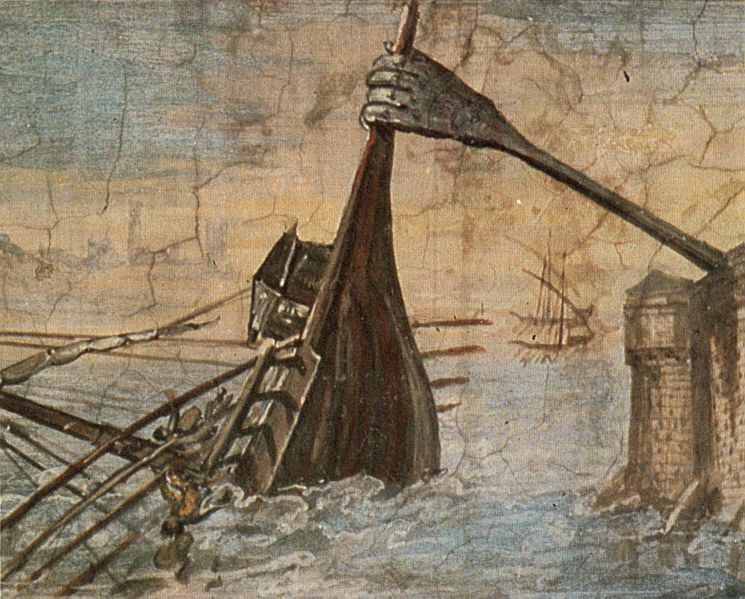 Plutarch (Life of Marcellus 17) reports that he not only hurled rocks at enemy ships with catapults, but also used a giant iron claw to lift them out of the sea and dash them against the cliffs; he’s also supposed to have set ships on fire by focusing the sun’s rays on them with giant mirrors. However improbable the mirrors may seem (they are, apparently, scientifically possible, but fairly unlikely at this period; not to mention the fact that none of the earliest sources mention it at all), it seems it wasn’t just the Byzantines who were good at setting things on fire. Thucydides 4.100 describes how the Boeotian besiegers of Delium invented a flamethrower out of a large log, some bellows, and a cauldron of coal, sulphur and pitch. Needless to say, the defenders fled. But what is this? I hear my regular readers cry. Half-way through a Weird and Wonderful blogpost, and no mention of any animals?! But fear not, reader, for thankfully people in the ancient world, in their infinite resourcefulness when it came to killing people, made use of whatever materials came to hand. In the course of the Mithridatic Wars, the inhabitants of the besieged city of Themiscyra, realising that the attacking Roman army was tunnelling under the walls, retaliated by digging into the tunnels themselves and releasing ‘bears and other wild beasts and swarms of bees’ (Appian, Mithridates 78). Quite what the bears were doing in the city is not explained. Pigs could also be put to good use against the most well-known battle animals, elephants: according to tradition the mere sound of a pig squealing was enough to terrify them. Alexander the Great is supposed to have used this tactic (according to the Letter to Aristotle about India*); the Megarians, beseiged by the Macedonians, took it a step further by covering the pigs with pitch and setting them alight to make them squeal even more loudly (Polyaenus 4.6.3). But the W&W first prize has to go to Hannibal the Carthaginian. Not for his famous elephants, but for his rather less well-known invention of a kind of early hand-grenade, recounted in Cornelius Nepos’ Hannibal X-XI: pots which, when thrown onto the deck of an enemy ship, would shatter to release large numbers of poisonous snakes. The tactic was later copied by the inhabitants of Hatra in Mespotamia, who fought off Septimius Severus’ troops by dropping clay pots full of poisonous insects, and possibly even scorpions, on their heads. Snake grenades and scorpion bombs: now *that* is Weird and Wonderful. Source credit: some stories courtesy of J.C. McKeown’s A Cabinet of Roman Curiosities (OUP, 2010), R. Stoneman’s Alexander the Great: A Life in Legend (Yale U.P., 2008), and A. Mayor’s Greek Fire, Poison Arrows, and Scorpion Bombs: Biological and Chemical Warfare in the Ancient World (Duckworth, 2009). *I can only find a translation of the Old English version of this text online. This Letter was originally composed in Greek but, since it became a major component of the Alexander Romance, was translated into various languages. I highly recommend the book by Stoneman listed above for anyone interested in the transmission of the various Alexander legends. Tags: Aelian, alexander the great, Appian, Archimedes, ballista, bears, bees, Byzantines, catapult, Cornelius Nepos, elephants, flamethrower, Greek Fire, Hannibal, onager, pigs, pirates, plutarch, scorpions, sieges, snakes, The Claw of Archimedes, Thucydides, war, weapons, weird and wonderful. Bookmark the permalink. At last the Romans became so fearful that, whenever they saw a bit of rope or a stick of timber projecting a little over the wall, ‘There it is,’ they cried, ‘Archimedes is training some engine upon us,’ and turned their backs and fled. Understandable, if it was anything like that picture! What is it about onagers and warfare? The beasts themselves pulled war-chariots in various Near Eastern societies. But just look at the picture on this page: http://en.wikipedia.org/wiki/Onager. They’re adorable. It’s like having an infantry unit made up of baby penguins. That’s what’s so cunning about using them. The enemy take one look and think, aww, how sweet, that can’t possibly be dangerous….